New awnings in Ridley Road Market have brought mixed blessings for traders who feel the council should instead prioritise making parking cheaper in the run up to Christmas. They were installed along with new signage in an attempt to smarten up the bustling Dalston street, but some traders have reported the awnings have been leaking. He said the shop had been forced to close for five days while the awning was fitted and had lost customers during this time. He said: “The main thing they have to sort out is the parking, it’s very expensive. Customers will spend £2-3, but they have to spend that amount on parking. But he added: “The biggest problem down here is the parking, customers pay £2 for half an hour, and if they go over it they get a £60 fine. 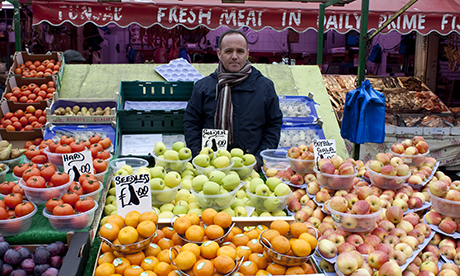 Another shop owner, costermonger Paul Smith, said Hackney Council should arrange free parking for market customers between 10am-2pm on Saturdays, adding that business in the market was currently ‘terrible’. Councillor Feryal Demirci, Cabinet Member for Neighbourhoods, said: “Replacing the canopies in Ridley Road Market and improving shopfronts is just a small part of a wide range of improvements to make the market a more attractive and welcoming place to shop. “We work hard to support traders but unfortunately many of the shops had canopies which were too big, breaching national safety guidelines and obstructing shoppers. Rather than simply order the traders to remove them, we provided them with new canopies free of charge which brighten the appearance of the market. This was funded jointly by the council and Covered Markets who own the units.